My #meatlessmonday post will just have to wait until I get home for dinner, because today I'm eating more frozen sushi from Aldi! 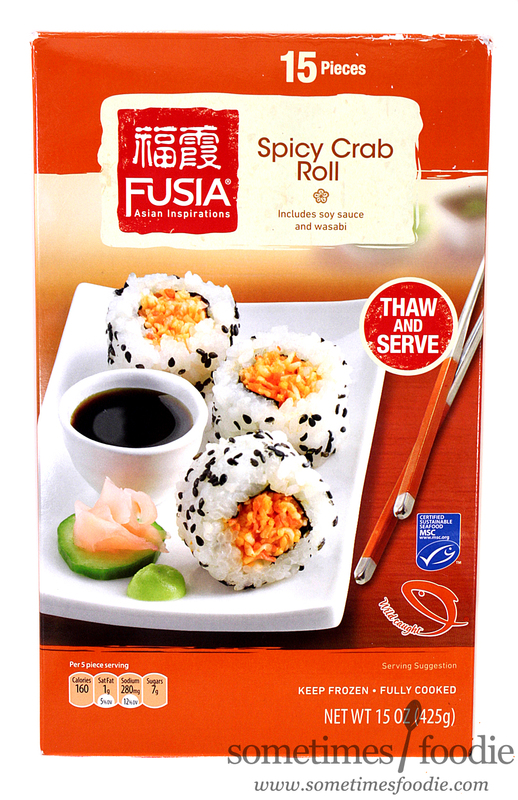 That's right, Aldi's frozen sushi entrees are back with new flavors! This year we have a Spicy Crab version, and a Shrimp with Avocado roll. You might recall my Aldi frozen sushi reviews from last year, and back then I was (admittedly) acting like a sushi snob. Part of that was me being respectful to the art of sushi making. I mean, this is frozen discount grocery store sushi that was made in America. Trained sushi chefs take their art VERY seriously. They have all kinds of rules and traditions that they follow when preparing and serving their dishes, and many chefs still believe in the antiquated notion that women can't prepare sushi. (You know, 'cause the chemicals in our lady brain makes the fish taste bad. Right?) I don't want to be closed minded like that, so we're back again, this time with a fresh perspective and an open mind. The packaging is the same as last year's, but with a different color scheme. I talked in depth about that in THIS post, so I'm going to skip the aesthetics this time around. I followed the same thawing method as I did last year, the room temperature method, and the sushi was ready to eat in roughly 2 hours. Inside you get 15 pieces total, which is pretty much one serving for me, but the box says it's 5-pieces per serving and contains three servings. Well, in my opinion, this is a meal for one. 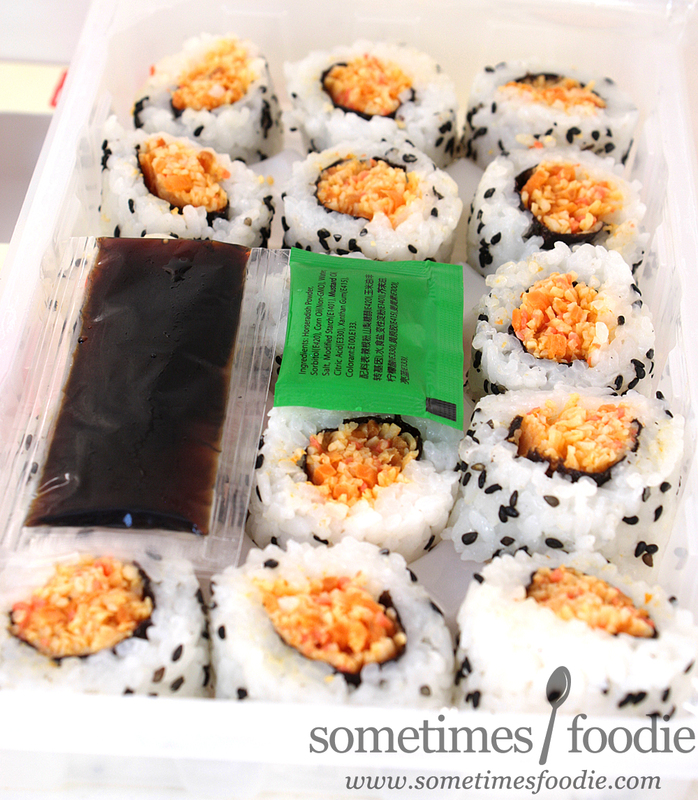 The tray comes with wasabi and soy sauce packets on the side, which is convenient, but I'm a sushi purist. I usually eat mine as-is without any additions, so I set those aside and dug right in. Not to toot my own horn, but my left-handed chopsticks skills are really improving! I'm right handed, so I use my right hand to operate the camera and my left hand to handle/model the food, and it's been quite the learning process. A few more photo sessions and I might be skilled enough to eat with both hands in public! 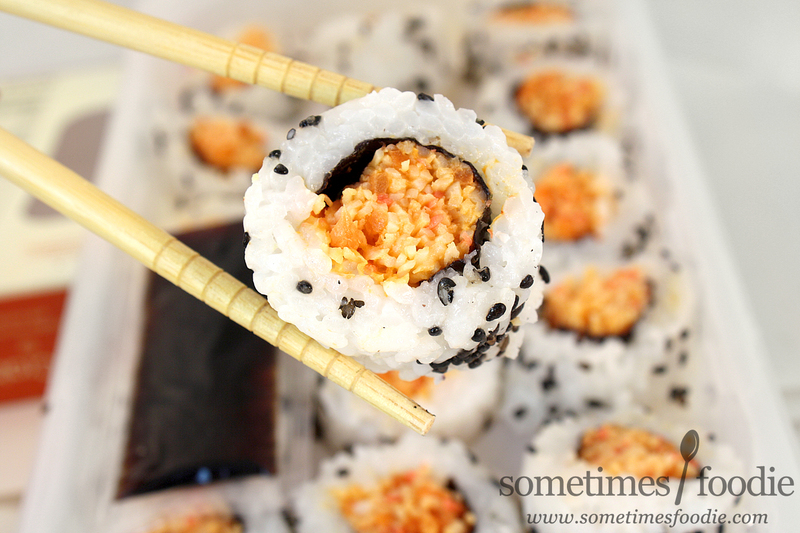 These rolls are a little chewy (freezing and thawing seasoned sushi rice is tricky) but they taste sweet, a little spicy (like wasabi), and fresh. I like it a lot! So far this is the best flavor I've had from Aldi, and I've already bought a few more to keep on-hand for lazy work lunches. To be fair, this does NOT beat fresh sushi from an actual sushi restaurant, and this is nothing like what you would get in Japan, but it's better than Trader Joe's and BJ's sushi. 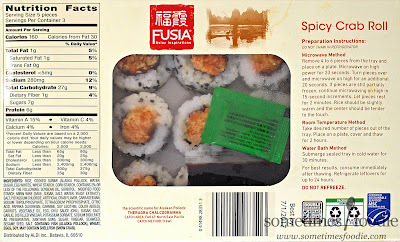 For a discount store like Aldi to offer a better sushi entree than those big-name brands, is pretty impressive. This is a decent, and satisfying frozen entree from Aldi and it's better than you'd think it'd be. Like you, I was pleasantly surprised by these. I use the microwave option very successfully. They are slightly warm when I eat them with soy sauce. I think they're a great deal for a quick, low-cal lunch.